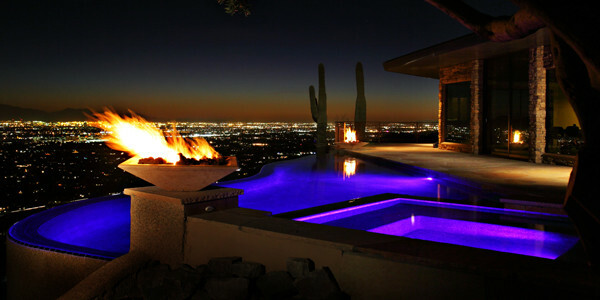 UNIQUE was hired by client to design a negative edge pool which would sit at the top of a mountain in Paradise Valley. This is the highest pool in PV and posed many challenges throughout the construction process. Access to the site was the biggest challenge faced by the UNIQUE crews. The twisting driveway wound up the hillside and once that obstacle was surpassed, there was no direct access to the backyard. The only access to the construction site was through the house. This required much extra care and additional planning as all of the excavation equipment had to be taken to the backyard through the house before it could be used to dig the pool. The approach was so difficult that the concrete trucks could only carry half loads to the construction site. But all of these challenges did not stop UNIQUE from creating the clients dream of a gorgeous 50 foot negative edge pool and spa with a jet black interior finish and a flagstone patio. This project is the proof that if a customer can dream it and has a location to realize their dream, then UNIQUE Custom Pools will find a way to bring that dream to life.